The trial is limited to few chords in category and to instruments in standard tuning. The reverse chord finder will not show the chord names found. ChordAid is a chord dictionary and chord reference application. It supports various stringed instruments like guitar, ukulele, mandolin or bouzouki in standard or custom tunings. You can also find the possible names of a chord by selecting the frets you have played on a virtual fretboard. It supports more than forty-five chord types. Among them are both simple chords and complicated ones used in jazz music, including slash chords (Cm/G). 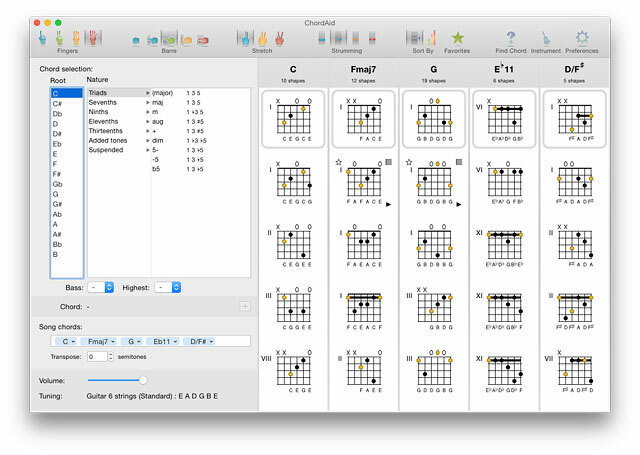 ChordAid uses sophisticated algorithms to produce the chord charts, which allows it to work well with instruments in standard or custom tuning. In addition to the usual chord shapes, ChordAid lets you choose among more difficult ones having two barres and big stretching between the fingers. You can drag and drop chord shapes to other applications. The shapes can be transferred as a resolution independent PDF or as a bitmap.